Most of us remember our pubescent years as years related to acne problems. One would think that these disgusting pimples will go away after a person exits puberty and, while this is true in most cases, some individuals keep experiencing acne well through their adult age. This article will dig deeper into the more-common-than-you’d-guess issue of adult acne and guide you through prevention of this inconvenience. Stick with this article and you might just succeed in ridding yourself of this troublesome issue. Family history – Genetics have a lot to do with adult acne. Think about whether a close relative, such as a sibling or a parent has acne. 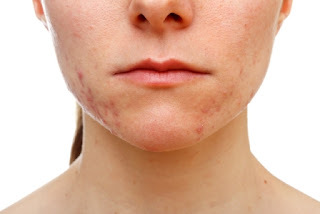 Genetic predisposition to acne is more than a common thing. Fluctuating hormones – An imbalance in hormones can cause adult acne. Think about when you are experiencing acne problems – cases such as times around periods, after using birth control pills, menopause, peri-menopause and during or after pregnancies. This is also a really common thing. Stress – Stress can be a cause of a lot of problems and acne are no exception. Acne flare-ups are often quite related to stress. To get to the science part behind it, our bodies produce more androgens when exposed to stress, which stimulate the oil glands and hair follicles beneath the skin, which can often cause acne flare-ups. Products – Hair and skin care product can often provide quite a negative impact on your skin. This is why it is vital that you carefully read the labels on the product you’re using. When choosing a product, regardless of whether it’s a cleanser, a moisturizer, or even sunscreen, you should look for ones with one of the following terms on the packing: non-acnegenic, oil-free, non-comedogenic and “won’t clog pores”. Medications – Many medications list acne as their side effects. Do not stop taking medication, however, at least not until you’ve consulted your doctor. Avoid spot treating – Instead of spot treating, opt for washing your face with a salicylic acid cleanser. This is especially important if your acne are hormone-based. Never forget to wash your face – Regardless of whether or not you’ve worn your makeup, you should always opt for washing your face – make it a nightly obligation. Most acne are caused by your skin collecting pore-clogging oil throughout the day. This is why it’s extremely important to properly wash your face, as well as to use oil-free face wipes. Use more acne fighters – Using benzoyl peroxide and salicylic acid is efficient when you’re using the two separately, but when combined, it can prove for wonderful results. Salicylic acid unclogs your pores, so that benzoyl peroxide can kick in to treat the breakouts. This is a great acne-fighting combo! Now that you understand the issue of adult acne better, you can approach this issue from a different angle, knowing what treatment to opt for. Keep in mind that washing your face with baby soap at least a couple times a day is a great way to keep your face clean, unclogged and acne-free! The watery gel from Aloe Vera plant is a highly effective natural cure against Acne. The enzyme-rich gel has very soothing anti-inflammatory and anti-bacterial properties. It can also be taken internally and helps clean up and detox the digestive tract. This in turn can help clear up the skin.